At the request of "Victory KoreDry" we reviewed the following item. 100% nylon UPF 50+ (UPF refers to ultraviolet protection factor) - 50+ means you will reduce your skins UV radiation exposure by 50+ times - this amount of UPF protection is considered excellent). Flat lock side, shoulder, neck and sleeve seams. Triple stitch hems. Fabric is a medium weight. 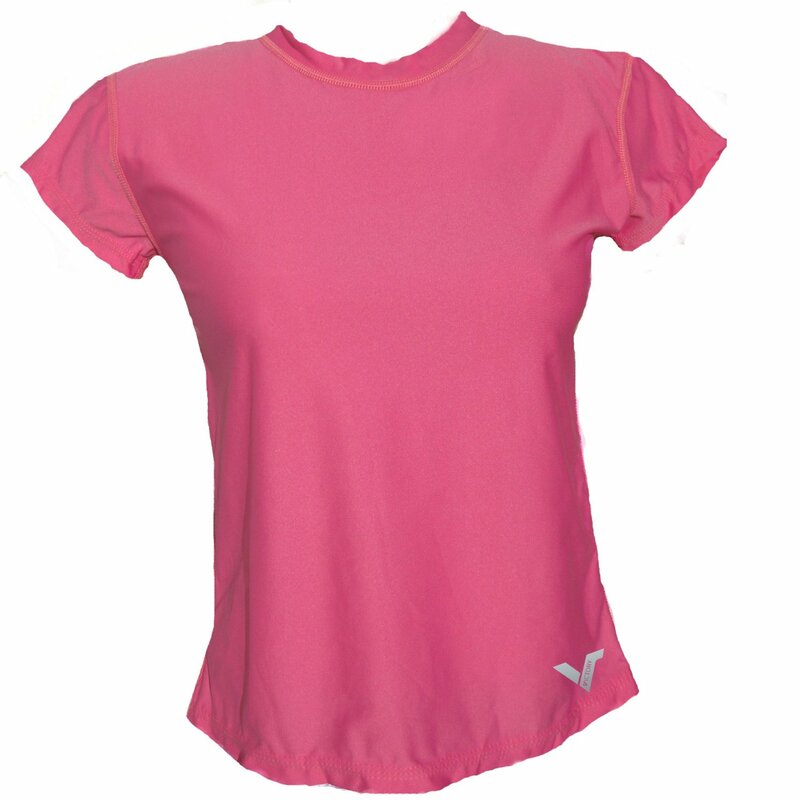 KoreDry suggests this top be used for SUP, surfing, diving, snorkeling, beachwear, and other water sports - we agree. True to size “regular" length A loose fit throughout the torso as the name states, including roomy arm and neck openings. The fabric provides good protection from the sun. This top was tested in the bright sun for two hours, visually, providing total sun block. Water resistant from water splashes. Comfortable. The fabric has a very fine texture probably attributing to the soft feel against the skin. Acts as a light wind barrier. Even after getting completely getting wet, water tries to bead rather than absorb. Sufficient stretch for active movement. No tags to irritate the skin. Care instructions are printed onto fabric. We received the Rose Pink colour. It is a very pretty bright pink. The logo is a delicate silver – this top is aesthetically pleasing with – a feminine look. The photo you see below looks like a scallop hemline—the top we received is cut straight across. If you like a loose fit this is the top for you. NRS uses a Neoprene manufacturing process called Terraprene - a calcium carbonate, limestone manufacturing process rather than oil so more earth friendly. Terraprene means more cells and more cells mean more insulation and more warmth. As well this material is lighter and more buoyant. The chart given to choose size is accurate and sleeve length is generous. This jacket has plenty of 4-way stretch and moves with you for easy paddling. Even with all that stretch their is plenty of compression. In particular the the short fleece on the inside is appreciated. It has a cozy, soft feel to it. It was 8 celsius / 46.4 Fahrenheit and a little windy the first time I used the full suit with a light nylon tank top underneath the jacket and the same brand of pants. Once I started paddling it provided plenty of warmth maybe even too much. No chill when getting out of the water and packing up although wind and tempurture differences could make a difference . The inside fleece feels soft and comfortable to the skin. Movement does not feel restricted in any way. The front zipper is heavy duty and good quality and opens/closes smoothly. Good quality in workmanship. the seams are glued and blind stitched. This jacket has a quality heavy duty nylon zipper. This jacket is a softer stretch than the NRS jacket with less compression. Very fashionable – aesthetically good looking. Roxy advertises this jacket as amphibious although the material is not breathable. This jacket is not ideal for casual wear only because it poses the potential to sweat. The fabric is non-breathable. It works very well for active water sports. This jacket feels less on the technical and more about fashion. It has it’s place. Perfect on a cool spring or cool summer day. It has a SPF of 50. KoreDry Lycra UPF 50+ (UPF refers to ultraviolet protection factor) - 50+ means you will reduce your skins UV radiation exposure by 50+ times - this amount of UPF protection is considered excellent). Flat lock stitched. Fabric is a medium weight. The fabric provides excellent protection from the sun. This garment was tested in 29 degrees celsius with a light breeze. When wet the fabric stayed cool in the warm weather until they dried. The 20% Lycra provides a comfortable firm fit. The Low profile hip band has an added 1/2” elastic at the top inside edge to prevent slipping downwards. The front is distinctly low profile while the back has been thoughtfully cut higher Seamless centre front providers added aesthetics. Water resistant from splashes and quick drying. Even after getting completely wet, water tries to bead rather than absorb. Comfortable, with a firm stretch. The fabric has medium weight. 4-way stretch. The flat lock stitching feels soft to the skin. Low profile hip bands can sometimes roll down. These capris did not roll down at all. The 4 inch band stayed in place during a casual 1 1/2 hour paddle boarding cruise. The front band pocket measures slightly under 2” deep and does not have a closure. The chart given to choose size is accurate and leg length is generous. There is no chance of skin exposure with a standard over the ankle neoprene sock. If your measure from crotch to waist is typically longer than normal you might wish it had a little more “rise." This pant has plenty of 4-way stretch and moves with you for easy paddling. Even with all that stretch their is plenty of compression. In particular I appreciate the short fleece on the inside. It has a cozy feel to it. It was 8 celsius / 46.4 Fahrenheit and a little windy the first time I used the full suit with a light nylon tank top underneath the jacket and the same brand of pants. Once I started paddling it provided plenty of warmth maybe even to much. I did get a chill getting out of the water and packing up though. The inside fleece feels soft and comfortable to the skin. Movement does not feel restricted in any way. At the top back of the pants is a little zipper pocket about the size of a business card for your keys and the like. I tried these shorts on thinking they were a women’s large but they were a men’s large and decided to keep them because they fit so well. So, sorry guys I can’t comment on the fit for you. Really appreciate the “Hydroskin” feel on the inside. It's soft and cozy. They have a tight 4-way stretch which makes them very comfortable. Good quality in workmanship. the seams are glued and blind stitched. The chart given to choose size is accurate. Note: depending on how tight the fit you prefer you can try two different sizes since these capris have plenty of stretch and not a lot of compression. Very fashionable - very cute. Movement does not feel restricted in any way. There is plenty of stretch - less compression than the NRS long pants.